If you make your living providing lawn and landscape services, we are SUPER-EXCITED you have landed here. 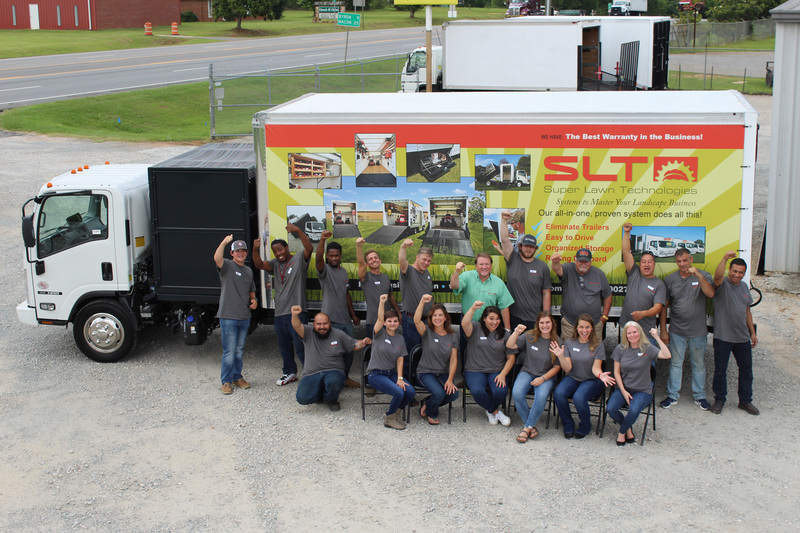 Since 1998 Super Lawn Truck™ has been designing, building and delivering highly customized trucks for lawn and landscape contractors across the USA. We take great pride in the fact that we invest 100% of our energy, creativity and financial resources to help professional lawn and landscape contractors succeed. Our patented products, such as our loading ramps, truck bodies, and truck body accessories have been engineered for daily commercial use in lawn and landscaping companies. The Super Lawn Truck ™ concept of combining a commercial work truck with an all-in-one truck body specifically designed to load and transport lawn equipment and landscaping crews has caught on as a productivity-enhancing option to the pick-up truck and trailer used by many lawn service providers. Our truck bodies and loading ramps are being used by the top landscapers in forty-six states and Canada. Since we build strong personal relationships with lawn business owners, we keep our eyes and ears on the latest trends, the biggest frustrations and new technologies used in landscaping. Here’s an example. Many contractors are fed up with the high cost of gasoline and the corrosive effects of ethanol blends on small engines. Two-cycle engines used to power weed eaters, backpack blowers, chain saws, and hedge trimmers require high-levels of maintenance and frequent repairs. Equipment that is hard to start frustrates employees and reduces crew productivity. A few brave contractors are trying something new. Battery powered lawn maintenance tools are now available for professional lawn maintenance contractors. Some battery powered lawn maintenance tools offer equal power to gas-powered tools. Contractors are learning that using electricity for fuel costs 1775% less than gasoline. Plus they can get rid of the problems associated with ethanol-blended fuel like damage to carburetors. So there are huge cost-savings to kick the gas habit. Lithium battery technology has opened the door for a transition away from gas-powered and towards battery-powered lawn equipment. Battery powered lawn mowers, weed eaters, back-pack blowers, hedge trimmers, chain saws, power pruners and hand-held blowers are now equally powerful compared to gas-powered tools. However, lithium batteries are expensive. So, contractors would rather not buy a ton of batteries. Instead, they can save money by recharging their batteries on-the-go while they work are while they are driving to the next lawn maintenance job. 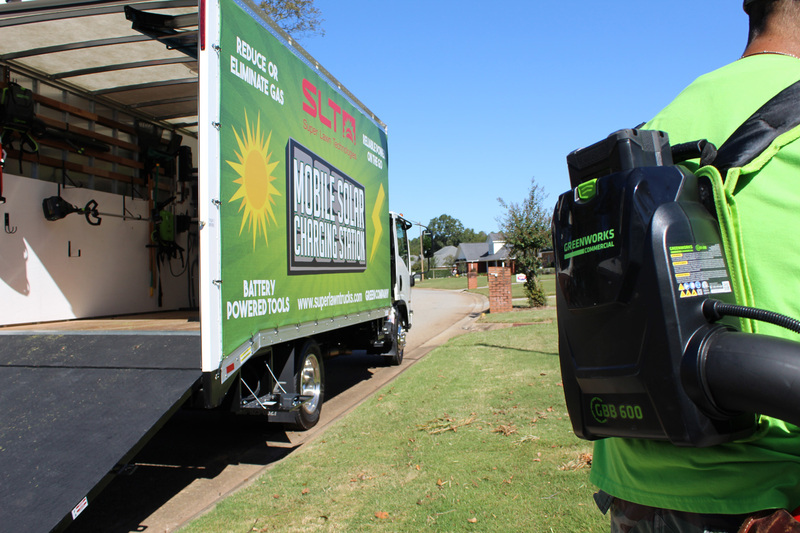 In 2017, Super Lawn Truck™ introduced the Mobile Solar Powered Charging Station to provide reliable, robust and renewable energy for on-the-go battery charging of commercial lawn care equipment. The patented enclosed truck body with a built-in loading ramp for loading commercial lawn mowers and ride-on lawn equipment is now equipped with solar panels on the roof of the truck body to capture clean energy from the sun. In 2019, Super Lawn Truck™ introduced the Generation 2 Mobile Solar Powered Charging Station with the purpose to allow for charging of zero-turn or stand-on battery-powered lawn mowers inside the enclosed truck body. This allows lawn and landscape contractors to begin the transition of the entire fleet of lawn equipment to battery-powered lawn equipment. We hope you find the Solar Lawn Truck website to be the best source for information related to commercial battery powered lawn equipment and mobile, on the go solar charging. The case studies, videos, articles, audio recordings and price quotes for Super Lawn Trucks with the Mobile Solar Powered Charging station are found right here on this website. We hope you’ll stay a while. But remember, we are constantly updating this website with new case studies from the field where lithium landscapers are playing by a new set of rules. So come back often. 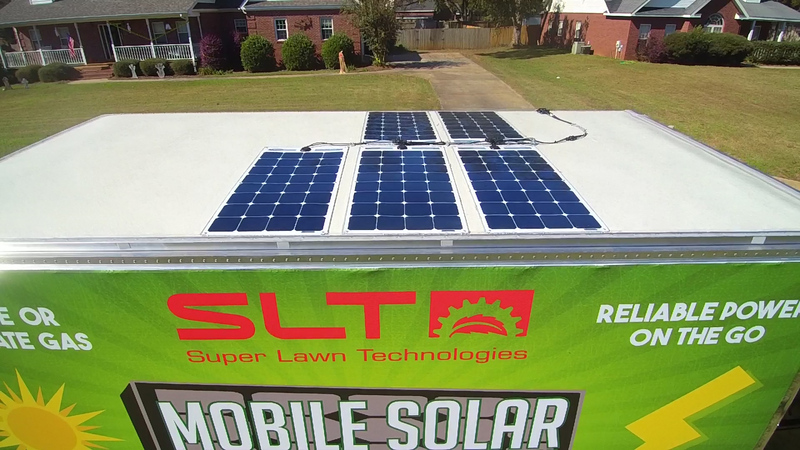 The Solar Lawn Truck™ is designed to allow contractors to fully adopt battery-powered lawn equipment to provide commercial and residential lawn maintenance services. The initial beta-test program allowed for recharging of batteries for hand-held tools like weed eaters, back pack blowers, chain saws and power pruners. Our clients fell in love with the quiet operation of battery-powered tools. Their field tests proved the concept that crew productivity could actually be enhanced when you switch to battery powered lawn equipment. In 2019, we introduced our Generation 2 Solar Lawn Truck that has a larger solar charging array, bigger charging capacity and the ability to recharge battery powered zero turn mowers inside the enclosed truck body. We believe the wide-spread adoption of battery powered lawn equipment is well underway. Super Lawn Truck™ recognized the need for contractors to have reliable on-the-go charging built right into their truck. That’s why we built the worlds first Solar Lawn Truck™. We want to help lawn business owners succeed. Frustrated with mixing gas and oil? Are you sick and tired of fighting the downtime with gas-powered tools? Are you ready to stop buying filters, spark plugs, carburetors and pull cords? Tired of NOISY power tools? Are your lawn and landscape employees tired of smelling like a gas can? If you’ve found us and read this far, I’m betting you’re the kind of person who likes to stay one step ahead of the competition. Congratulations! There’s a quiet revolution coming to the lawn and landscape industry. The future of eco-friendly lawn maintenance is energized by clean solar energy and quiet operating battery powered hand tools. Some are calling this the Lithium Revolution. It starts with the Mobile Solar Charging Station by Super Lawn Trucks and your decision to say YES to battery powered lawn and garden tools. The future has never been brighter for forward-thinking lawn and landscape business owners. With this new technology, you can help our country get off foreign oil every time you mow, edge, trim or blow off a lawn and lower your gas bill as you impress your customers! Just click the link on this page to see if your company could qualify to be one of our ten beta-test companies and receive $6000 in free battery powered lawn equipment. Along the way, you’ll be recognized as a green industry trend setter and eco-friendly business. Looking forward to our conversation.